The past week was freaking gross hot, like sweaty, smelly, I want to live in the Costco walk in freezer hot. But today, well today was the most lovely day. A cool dry 70 with a nice breeze and sunshine. Then around dinnertime, a little bit of rain, followed by a rainbow. It was the most fantastic perfect weather.This is why I love living in Vermont. We get weather. .Last night, dinner was all about trying to make some more room in the fridge for the farm share pick up tonight and to make something that I didn't have to really watch. (the mr and I were moving the beehive to the roof of the house so I wanted to make something that I could leave on the stove and not have to babysit (just stir every now and then). With the weather being so freaking amazing, with a cool crispness in the air, I was craving something a little more on the warm and comfy side. 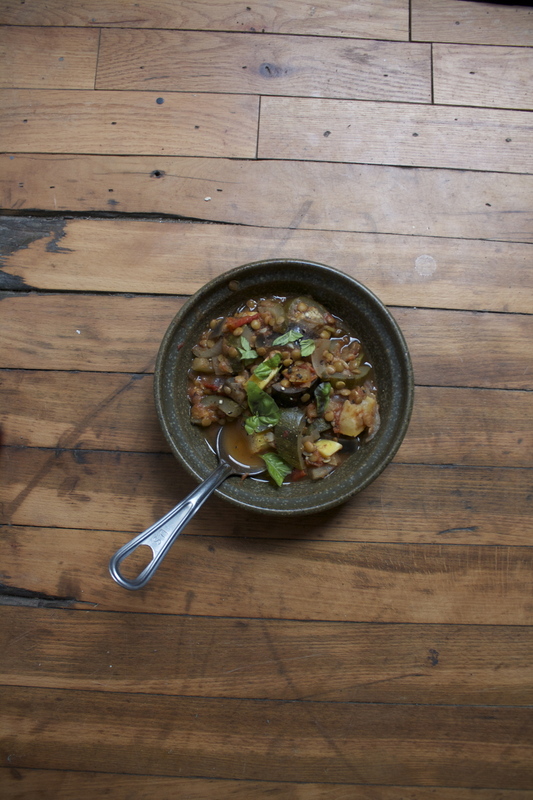 And what do you know, the stuff I had left in the fridge (there is still a basket of zucchini on the table) was what was needed for a big pot of stewed summer ratatouille with lentils. It was everthing that I ever could need and want for a meal. Full of the best veggies and lentils, easy to make, nothing fancy to do. Just stick stuff into a pot and cook until done. Cooler, light long sleeve, kind of weather. Enough rain where I didn't have to water the garden, the most perfect pot of the best ratatouille shared with the mr. and a feeling of accomplishment and excitement (bees on the roof!). The stuff. 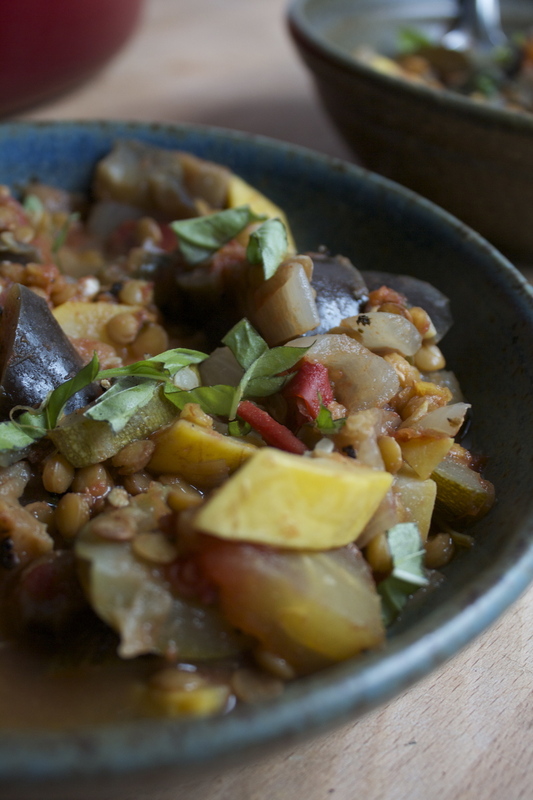 Zucchini, yellow summer squash, eggplant, onion, tomatoes and lentils. And we have some fresh basil, fresh oregano, balsamic vinegar, olive oil, and some salt and pepper. To get this party started, chop up the onion and toss it into a big heavy pot with a little olive oil and a sprinkle of salt. Stick on the stove on medium heat. While the onions are cooking, mince up the garlic and chop up all the other veggie into medium sized chunks. When the onions start to become translucent and smell fantastic, add in all the veggies and garlic. Give it a big stir and place back on the stove to cook for a few minutes to let the veggies release some of their liquid. Then add in the lentils along with a equal amount of water and top with a lid. After about 30 minutes, the lentils should be near done and the veggies tender, the tomatoes pretty much dissolved. Now chop up the basil and oregano and toss it in along with a few swigs of the balsamic vinegar. Give it a stir and keep on cooking for another 10ish more minutes or until the lentils are nice and tender. Scoop onto bowl then into mouth. If you like, finish off with a bit more fresh basil or,ike the mr, top with parmesan cheese. Have a fantastic day! So close to the weekend! !